If all advertising sales start with sales calls, then it is imperative that sales people structure their time to get appointments. Many of my national sales clients tell me that they accept 5 to 8 sales calls a week as reasonable for a property selling big-brand advertising, because so much time must go into preparing for calls and servicing clients. 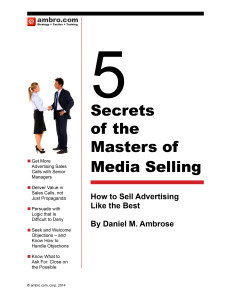 Advertisers and agency people often say they don’t need to see sales people. The trouble with that is that clients will keep doing whatever they have done in the past; buying from your competition, or buying less than they should, until your sales person gets that appointment and begin to persuade them to view things differently. If you are a sales person or manager who wants to lift their number of sales calls you can start here. Imagine that management wanted sales people to have three substantive sales calls per day. That would be 15 per week. There is a simple (not easy) way to do it. Sales people must come in every morning with a goal of contacting enough prospects to schedule 3 meetings for the future. They need to stay at it long enough, or start early enough, with as many calls and emails as necessary until they have scheduled 3 calls. Then they can go on about their day. If a sales person makes three appointments per day, soon enough they’ll have three-a-day to go on. It may not be easy. Determined sales people may find they need to start earlier, or have a list of calls to make on their drive in to work in order to make it work. When sales results are looked at through this prism as a simple math problem, sales tasks can be broken down into parts and accomplished. If sales people aren’t done with their call-set-up by 10:00 am, they are probably trying to call prospects when their competitor is sitting in their prospect’s office having a meeting. That will never do. The more important the prospect is you are trying to reach the earlier they get in the office. Sales people need to start early, too. Sales people can make it even easier if they make a list of contacts at the end of each day that they wish to contact the next morning. By sending an introductory email the night before to each proposed contact, they are paving their own way. Need to make 3 appointments tomorrow morning? Try 20 sending emails this afternoon-evening introducing yourself and/or explaining the reason for your contact and request for an appointment. Follow-up the next morning with phone calls, and you are well on the way. If a sales person has 100 clients and prospects and each one has an average of 2 points of contact for a successful sale, that is 200 appointments that need to be made in a quarterly sales cycle; 12 weeks, 60 work days, 3.3 calls per day. Of course, some will have less points of contact and some have more contacts who influence the sale. But it will take about 3 months to cover that many contacts. Some will require more frequent conversations, some less. The key here is to manage the metrics that matter. And I think you agree, if you are still reading this, that sales calls matter.